Located in the far northeastern corner of Kentucky, Ashland has more in common with the coal mining country of West Virginia than much of the rest of the “Bluegrass State.” Ashland's position on the Ohio River connected it to both Ohio and West Virginia, and helped the city develop into an industrial, mining and trading hub for eastern Kentucky. During much of the 20th century, Ashland was also home to a small but dedicated Jewish community. Jews first arrived in Ashland in the years after the Civil War. Most of these early settlers were immigrants from Germany who opened retail stores in Ashland after the railroad came to town. These early settlers were later joined by a new wave of immigrants from Eastern Europe. Initially, the number of Jews was very small. By 1909, only 38 Jews lived in Ashland. Most were merchants, although a few were peddlers or junk dealers. These early merchants included Russian immigrant Ben Josselson, who moved to Ashland from Morehead, Kentucky in the first decade of the 20th century, opening a retail clothing store. Simon Harris left Russia in 1891, and lived in Ashland by 1896, when he opened a men’s clothing store. Nathan Albert owned a clothing store in Ashland by 1910. His son-in-law, Isadore Levison, was also a men’s clothing merchant in Ashland by 1910. Levison later owned a furniture store, which remained in business until his death in 1947. By 1896, enough Jews had settled in Ashland to establish a congregation, Agudath Achim. This Orthodox congregation met in rented spaces in downtown Ashland for many years before they were able to build their own synagogue. The congregation had a religious school, which was run by Simon Harris in 1919. While Agudath Achim was Orthodox during its early years, the congregation decided to join the Reform movement in 1921, affiliating with the Union of American Hebrew Congregations. That same year, they also started to bring in student rabbis from Hebrew Union College (HUC) twice a month to lead services. In 1925, the congregation, which numbered 34 families, bought land for a cemetery. This embrace of Reform Judaism alienated more traditional members, who broke away and established a new Orthodox congregation, House of Israel, in 1921. By 1927, an estimated 170 Jews lived in Ashland, divided into two small congregations, neither of which had a synagogue or a full-time rabbi. As late as 1937, both congregations met in rented rooms on Greenup Street in downtown Ashland. In 1935, a student rabbi from Hebrew Union College reported on the state of the Ashland Jewish community. Agudath Achim and House of Israel each had about thirty members at the time. He also found “a distinct cleavage” between the members of the two congregations, which could not have been beneficial in such a small Jewish community. Nevertheless, there were other Jewish organizations in the city which could serve to unite the local Jewish community. There was a B’nai B’rith Lodge in 1935 as well as a Jewish Young People’s League. In addition, both congregations had Sisterhoods. The growth of Ashland’s Jewish community in the 1920s mirrored the growth of the city itself. The American Rolling Mill Company (ARMCO) bought up local iron manufacturing companies in 1921, and oil was discovered in the area during the 1920s. By the mid-1920s, ARMCO and the newly formed Ashland Oil Company became the city’s largest employers. Ashland’s population doubled during the 1920s, reaching 29,000 people by 1930. While Jews did not generally work for these large companies, their stores benefited from the increased population and the new money pumping through Ashland. Joe Mansbach found a successful niche in scrap metal, which was closely tied to local industry. Mansbach came to the United States from Galicia in 1911. After working as a tailor in New York City for three years, he moved to Louisville where his sister lived. He married Sylvia Fish in 1918, whose father Barnet had just started a small scrap business in Ashland. Mansbach joined the business, and soon after took it over. Mansbach started out trading in used burlap sacks, but soon moved into scrap metal. He would buy scrap metal from ARMCO and nearby coal mining companies in Kentucky and West Virginia. His wife Sylvia also worked in the business. After weathering the hardships of the Great Depression, the business thrived during World War II and its aftermath. After the war, Sylvia and Joe’s sons Sam and Jerry eventually joined the Mansbach Scrap Iron Company. In 1964, the sons expanded the business, opening their own steel manufacturing company. By 1974, the steel operation had 500 employees, while the scrap side of the business employed 150 people. House of Israel's closing years. Photo courtesy of the Tulkoff family. The Mansbach family was central to the origin and development of House of Israel. As an ardent Orthodox Jew, Joe Mansbach helped to establish House of Israel after Agudath Achim had become Reform. When the group struggled to get a minyan in its early years, Mansbach helped to organize the members, ensuring that ten men would be present for Shabbat services. By 1935, House of Israel had about thirty members as well as a Hebrew school. Most members kept kosher; there was a shochet in Ashland at the time. After World War II, Mansbach led the way in constructing a synagogue for House of Israel. He donated land on Carter Street to the congregation. He then headed the fundraising effort; when he had raised all that he could, he made up the difference himself with a sizable donation. Thanks to the efforts of Joe Mansbach, House of Israel dedicated its first synagogue in 1947. House of Israel was not Ashland’s first synagogue; Agudath Achim had built its own temple in 1938. After World War II, membership in the Reform congregation peaked while House of Israel’s sharply declined. In 1947, Agudath Achim had 51 members, 20 students in its religious school, and was bringing in student rabbis from HUC in Cincinnati twice a month. A few members lived in surrounding towns, including Ironton, Ohio. With this rapid growth, there was even talk of trying to hire a full-time rabbi, though this never came to fruition. By 1962, the congregation reached its peak of 55 member families. One reason for this growth was the fact that many members of House of Israel had also joined the Reform congregation since it was the only one with a religious school. The immigrant generation that had founded House of Israel was graying while younger families were more likely to join Agudath Achim. 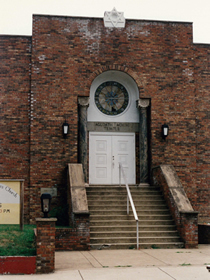 By the mid-1950s, the Reform temple was the center of Jewish life in Ashland, and there was talk of merging the two congregations. 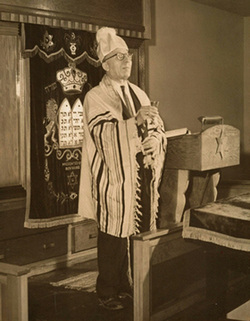 In 1954, the HUC student rabbi for Agudath Achim was asked to wear a tallit and robe to appease more traditional Jews and he reported that House of Israel and its members were “being integrated into the Reform congregation via special arrangements throughout the year.” That year, the religious school had 33 children, with ten in the first grade alone. Beatrice Gehringer ran the Sunday School at Agudath Achim for 25 years. The two Ashland congregations never formally merged. House of Israel remained much smaller than Agudath Achim, though relations between the two had greatly improved since the 1930s. By the 1960s, members of the Reform congregation would help House of Israel reach the minyan requirement of ten men to hold services. Joe Mansbach remained the central force of the Orthodox congregation. After he died in 1976, House of Israel closed and sold its building. After World War II, most Ashland Jews remained concentrated in the retail business. Ben Kaplan had opened Star’s Men’s and Boys’ Shop in 1931 with his sons Saul and Gorcy. While Gorcy soon moved to Cincinnati, Saul Kaplan remained in Ashland and purchased the business from his father in August 1948. Saul’s daughter Sharon later joined the business in 1957 along with her husband Robert Simons. Later named Star’s Fashion World, the business grew and expanded over the years to become the largest clothing store in town. The entire Simons family worked in the store including the Kaplan grandchildren. When none of the grown children wanted to take over the store, Saul, Robert and Sharon decided to close the business in 1993. Harold Freedman owned a department store in nearby Catlettsburg, though he lived in Ashland. The store had been started by his father Julius in 1936. Harold joined the business in 1947, running it until he closed the store around 2000. Other stores during the post-war era included Royal Jewelry, owned by Jack Landau, and Don’s Men’s Shop, opened by Don and Betty Korros in 1948. When Ben Kaplan first opened his clothing store in 1931, he called it “Star’s” because he did not want to include his Jewish-sounding last name on the sign. He was not sure how the town’s Gentiles would react to a Jewish-owned store. His initial concerns proved to be unfounded as Ashland Jews were well-accepted and became closely integrated into the city’s civic and social life. Both Saul Kaplan and Sam Mansbach spent many years on the board of the local medical center. Kaplan was also a charter director of the Bank of Ashland, later sold to Fifth-Third Bank. Robert Simons was a leader of the local business community, serving as president of the Ashland Chamber of Commerce. He also served as Chairman of the Board of Kings’ Daughters Hospital as it developed from a local hospital to a regional medical center. The Chamber of Commerce gave Simons its first Cornerstone Award for his lifetime of service to Ashland. Most notably, Simons headed the Ashland Economic Development Committee, which helped to redevelop the city’s downtown. The city also elected two Jewish mayors. Clyde Levi served from 1944 to 1947, and David Aronberg served from 1952 to 1955 and from 1960 to 1964. While Jews were integrated in the larger community, they maintained their Jewish identity. Saul Kaplan spent many years as head of the United Jewish Appeal in Ashland, raising money for Israel and other Jewish causes. During the 1950s and 60s, the Jewish community was very close-knit with many kinship ties between Ashland Jews. While Ashland Jews were committed to maintaining their religious traditions, demographic changes made this increasingly difficult. During the 1960s, the Ashland Jewish community began to decline. Agudath Achim had dropped to just 39 families by 1970. Only seven children were in its religious school. The student rabbi that year reported “children moving out. People dying. Community becoming smaller.” Many of the children raised in Ashland during the post-war years had moved away to larger cities. By the 1970s, many of the Jewish-owned stores began to close in response to the rise of national retail chains. The city itself was in decline, as much of the local steel and oil industries closed. Ashland has lost population every decade since 1960. In the early 1970s, Agudath Achim discontinued its religious school as the few remaining Jewish children in Ashland would travel to Huntington, West Virginia for Sunday school. When Gwen Simons was confirmed in 1975, she had to travel to Huntington for confirmation class, and meet occasionally with Ashland’s student rabbi. She was the last person person confirmed at Agudath Achim before its closing. In 1977, the congregation cut back its student rabbinic visits to only once a month. Attendance at Friday night services was sparse as the congregation’s membership dropped. By 1985, only ten households belonged to Agudath Achim. The following year, these remaining members made the difficult decision to close the synagogue. They sold their building to a church in 1987. The building was eventually purchased and torn down by King's Daughters Medical Center. Agudath Achim still existed on paper, though they had ceased to function as an active congregation. The remaining members decided to maintain the proceeds from the building sale and hold them in case a number of Jews ever moved to Ashland and desired to restart the congregation. In the meantime, they used the interest from the funds to support local charities each year. Most joined the B’nai Sholom congregation 25 miles away in Huntington, West Virginia; the congregation’s memorial plaques went there as well. In 1998, the few remaining members of Agudath Achim met and decided to disperse all of the funds. The money was divided between Hebrew Union College, B’nai Sholom in Huntington, Ashland Community College, and a local charity serving Ashland’s needy. With that, Ashland’s last Jewish congregation ceased to exist. Today, fewer than ten Jews still live in Ashland. The Mansbachs have sold their family scrap metal business, and Don’s Men’s Shop, run by Betty Korros, is now the last Jewish-owned store in town. A few Jewish doctors have moved in Ashland in recent years, working at the local medical center, but most have not stayed very long. While Ashland once boasted two Jewish congregations, the days of organized Jewish life in this corner of northeast Kentucky have likely passed.